Dorothy L. Sayers's incisive portrayals of Britain's leisure class in the 1920s are brought to life in these lavish BBC adaptations. Aired on PBS's Masterpiece Theatre, they proved so popular that they inspired the Mystery! series. 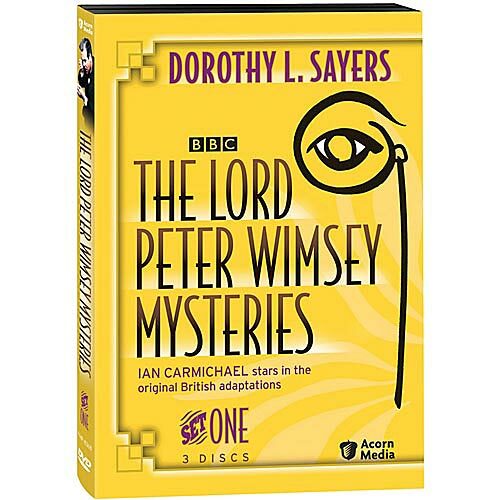 Starring Ian Carmichael as the aristocratic and surreptitiously clever Lord Peter Wimsey, these two mysteries preserve Sayers's trenchant wit and showcase the talents of a top-notch cast. 2 mysteries on 3 DVDs, approx. 402 minutes, SDH. The tranquility of the Wimsey family's Yorkshire retreat is shattered by a death in the family. Mary Wimsey's fiance, Denis, receives a letter that prompts him to flee Riddlesdale Lodge. But he only makes it to the garden, where in the wee hours of the morning, Mary discovers her brother Gerard kneeling over his body. Why both siblings were out for late-night strolls puzzles Lord Peter, who joins the case to prove Gerard's innocence. It seems that both his siblings are hiding something: Mary fakes a serious illness and Gerard simply refuses to answer questions about the night Denis died. When General Fentiman is found dead in his chair at the posh Bellona Club, the cause seems straightforward: a heart attack brought on by old age. Then Lady Dorland, the General's sister, dies on the same day. Is it a startling coincidence or something more sinister? Called in to investigate, Lord Peter becomes suspicious of the general's grandson, whose peculiar behavior and whereabouts on the night of the deaths seem incriminating. But these suspicions are overshadowed by the discovery that Miss Dorland, Lady Dorland's niece, has an abiding interest in poisons.